Read the full story from the Journal Sentinel here. anuary has been surprisingly balmy and relatively snow-free, until now. And that change in weather is just in time for the ice bars. You've got options this weekend. There are three ice bars in the Third Ward at St. Paul Fish Co., Benelux Cafe and Wicked Hop. Or hit up the Fire + Ice Party on the east side in Black Cat Alley. So put on your snow boots and hit the town. The corner of East St. Paul Avenue and Broadway in the Third Ward is where most of these bars are clustered. Patrick Nedobeck, manager at St. Paul Fish, said, "Last year we did have to postpone a couple times because the first weekend it was warm. Without the cooperation from the weather it's tricky." The Third Ward bars have been working with local company Art Below Zero to design the ice bars, which open today at 5 p.m. Nedobeck hopes the bars will stick around for two weeks before they melt. 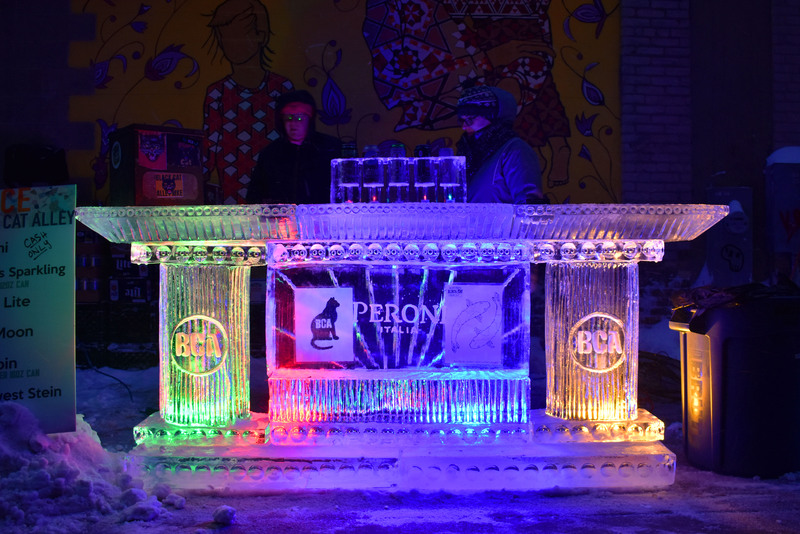 Each ice bar is offering specialty drinks. St. Paul Fish is serving a Swedish glogg, a hot, spiced wine and rum drink that Nedobeck says takes him three hours to make. Cafe Benelux's menu features a winter marmalade mule and booze-free hot chocolate, while Wicked Hop has cocktails on tap. On the east side, Black Cat Alley's Jan. 19 Fire + Ice party coincides with Gallery Night. The party is in an alley off East Ivanhoe Place between North Prospect and North Farwell avenues. The party goes from 5 to 9 p.m. and features a fire pit and an ice bar. Get there before it melts.